Women’s History event in the Liberties – 29th & 30th June | Come Here To Me! ’24hr Community’, a NCAD art collective formed earlier this year, and the ‘May Day for Thomas St.’ initiative have joined forces to temporarily take over two vacant buildings on Thomas St. for the purpose of an exciting new history project. 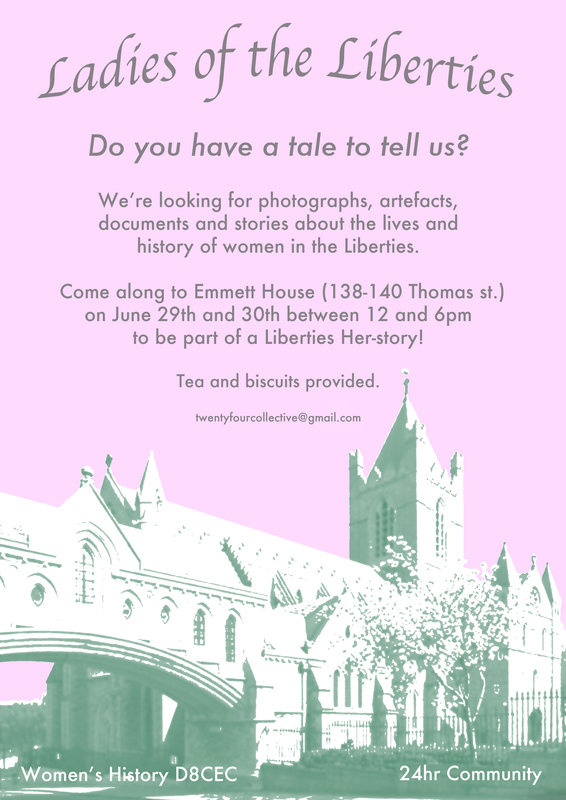 Next weekend (June 29th to 30th) they are asking local women to come to their new studio at Emmett House with photographs, documents or other artefacts they may have, with a view to compile an archival history of the Liberties from the perspective of the women who inhabit it. On hand will be scanners, audio recorders, and cameras to document whatever in by locals. All items will be treated with great care and will be returned immediately after the documentation process.